This Irish unity candle holder features a large pewter pillar with the Claddagh. The Claddagh candle holders measures 5" wide x 2" 1/2" tall. Please note that the candle is not included. This Claddagh unity candle holder would be ideal for your Irish wedding or for your home decor. 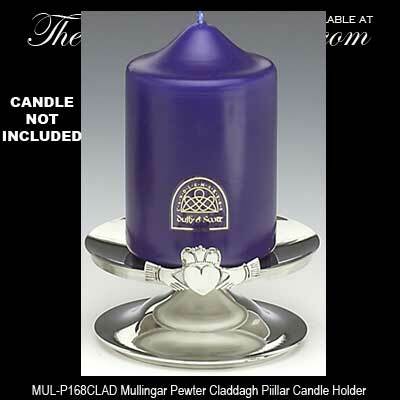 The Irish unity candle holder features the Claddagh prominently displayed on the front of the pewter pillar and it is made in Ireland by Mullingar Pewter. The Irish candle holder is gift boxed with a Claddagh history card that is complements of The Irish Gift House. This pair of pewter candle holders features Celtic knot-work.